The Socialist National Committee ("SNC") is the embodiment of the Socialist Party's legal status as a national political party. 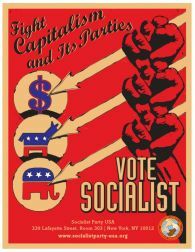 The Federal Election Commission has actively recognized the SNC as the Socialist Party's national committee since 1980, and the Socialist Party continues to remain among the only eight United States political parties officially recognized by the FEC to hold national political party status. Socialists participate in the electoral process to present socialist alternatives. The Socialist Party does not divorce electoral politics from other strategies for basic change. While a minority, we fight for progressive changes compatible with a socialist future. When a majority we will rapidly introduce those changes, which constitute socialism, with priority to the elimination of the power of big business through public ownership and workers' control. We advocate electoral action independent of the capitalist-controlled two-party system. By fielding Socialist candidates in elections at all levels of office, Socialists educate the public about socialism, agitate for radical reforms and socialist solutions, and promote the politically independent organization of working people in direct opposition to the twin capitalist parties. We rely on your contributions to help us present a socialist alternative in the electoral sphere and continue to expand our ability to educate, agitate, and organize, for the fundamental transformation of society that we so critically need to achieve. Please contribute to the Socialist National Committee, through the online donation button to the left or by sending a check or money order. 100% of all financial contributions made to the SNC go directly to supporting legal and outreach expenses in support of Socialist candidates running for political office at all levels. 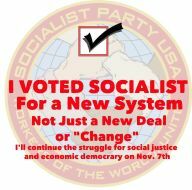 Please check back for additional Socialist Party candidates to be listed as they are nominated. Visit the Campaign Clearinghouse Press Room for Press Releases, Campaign Statements, and Media Coverage of Socialist Party candidates and campaigns. Make a Contribution to the Socialist National Committee! 168 Canal St. 6th Fl. Whether you can contribute $5 or $30,000, every contribution serves to expand the size and scope of our reach in presenting a socialist alternative to working people throughout the United States. All donations made to the Socialist National Committee will be distributed to Socialist Party electoral campaigns for all levels of office, ranging from local Socialist Party city council candidates to the Socialist Party ticket for President/Vice President of the United States. If money is tight but you would still like to help out, please contact us for information on ways you can volunteer to help socialist candidates in your area and across the nation. Because of the political nature of our work, contributions are not tax-deductible, and we have to report donations of more than $200 to the Federal Election Commission.